True Rust Bucket Photo Picture Classic Cars for sale & Classifieds - Buy Sell Classic Car & Classic Truck Classifieds. It looks like one of those Toyotas or Hinos or something. Something from China or Japan. OMG how did that happen????????????????????????????? was there a fire? what the hell happend? 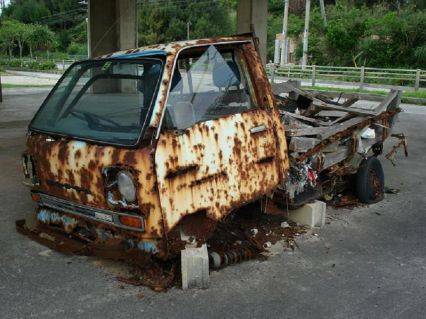 Looks like it has been in alot of acid rain. Or maybe it just had cheap, thin, low-grade sheetmetal. i could use some parts from it they are now importing these things for yard trucks they are awsome they have heat unlike the atv work horsesand they are made by daihatsu, subaru mazda,and a few others. they are available in 4x4 also. I agree with dodgewolfgang OW! I wouldn't want this on my front yard! somebody put this poor thing out of its misery.